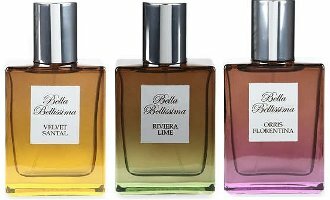 UK niche line Bella Bellissima has launched four new fragrances: Velvet Santal, Riviera Lime, Orris Florentina and Majestic Cedar. Velvet Santal ~ "Velvet Santal eau de parfum by Bella Bellissima is an alluring lightness of osmanthus, touched by radiant hesperidic notes, cypress and aromatic mint tumble into mellow warmth, unveiling the luxuriously smooth heart of finest, creamy santal. Precious floral accords emerge, intertwined with hawthorn, spiralling into a rich base of blonde woods, golden amber and tonka." Riviera Lime ~ "Riviera Lime eau de parfum by Bella Bellissima is unreservedly bold and bursting with Italian citrus. The intense freshness of lime, Tarocco grown in the shadow of Mount Etna, Sorrento lemon and Calabrian bergamot are interlaced with dark agarwood oil and Aquila saffron. Dry woods and resinous amber add power to the unique character." Orris Florentina ~ "Orris Florentina eau de parfum by Bella Bellissima is delicate and subtle, created with the most exclusive and luxuriant extract of Tuscan iris - orris butter – a five year process produces a treasured ingredient which drapes the skin, soft as suede. Calabrian bergamot, Tahitian vanilla and raspberry enhance this unexpected and mysterious scent." Majestic Cedar (not shown) ~ "Majestic Cedar eau de parfum by Bella Bellissima is a homage to the stately cedar. Rich, softly spiced undertones of nutmeg and black pepper settle over the resolute and woody, resinous heart of Atlas cedar, Sri Lankan vetiver, Indonesian patchouli and smoky encens. Pure sandalwood and oak moss ground this powerful, reassuring composition." Bella Bellissima Velvet Santal, Riviera Lime, Orris Florentina and Majestic Cedar can be found now at Selfridges in the UK, in 100 ml Eau de Parfum, £96 - £110.